I'm 17 and I'm about 160 cm and my weight is 47 kg . I just want to know if I will still grow taller ? If you want to know for sure go to a doctor and have them look at your Epiphyseal Plates in your long bones (Femur, Tibula, Fibula). If they've fused, you won't grow anymore. If they're still distinct then you'll continue to grow until they fuse. For males that can happen as late as early-20's. However, depending on genetics, you might not gain that much height. You're at the tail-end of probably your last growth spurt. You have probably 2-3 years' worth of growing left, but don't expect miracles. You've got maybe another 1-2cm. 1) From the science of antropometry you might find some clues of the probability that you have of growing taller. For example, if your body (hairs and stuff) already look like an adult body, then you would probably not grow much more. See @MCM's answer who gives a solution that will be way more useful to you than my answer! 2) Knowing the size of your parents you can infer your expected size. Below are some comments on this question. Estimations of heritability (in the narrow sense, see this for more info) can also be realized with selection experiments or parent-offspring. The heritability of height in humans is around 0.6 (Welcome to anyone who can give an accurate value and a good reference) which is quite high. It means that more than half of the variance in height among humans has to be accounted to genetic variance. If your parents are tall, don't lose hope, you have quite a good probability to grow tall. Not the answer you're looking for? Browse other questions tagged human-anatomy or ask your own question. Is there some genetic variance underlying music appreciation? Is intelligence (or mental ability) genetically transferred (inherited characteristic) from the parent to the offspring or is it an acquired trait? Are people genetically predisposed to being interested in specific fields/ideas? How does specialization occur? What is the average Leg-to-Foot Length/Width Ratio? 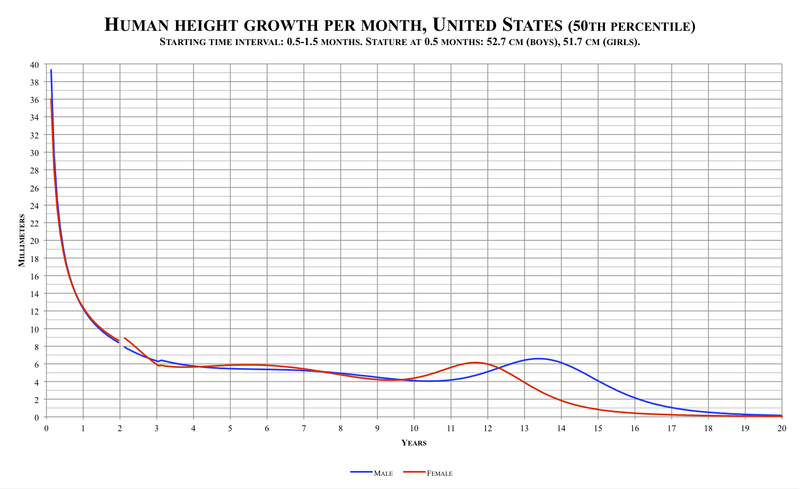 Is it possible to still grow taller after growth plates have been closed? I'm 20. Can I still grow taller? Why do toenails grow much slower than fingernails? How do muscle relaxants work? Can someone who cannot talk still whistle? Why do men grow facial hair? What is the effect of reduced gravity on human height? How large is the variability in human bone thickness, and is “big boned” a real thing or not? Do all body organs grow in proportion during the period of physical development?